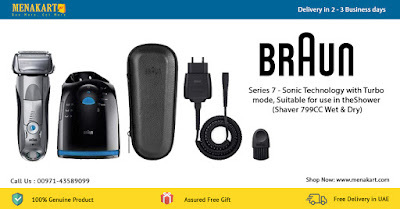 The Braun Series 7 799cc 7 Electric Wet and Dry Foil Shaver with Clean and Charge Station helps you get the perfect shave with fewer strokes and zero irritation. The electric shaver comes enriched with the intelligent Sonic Technology that enables the shaver head to generate 10,000 micro vibrations per minute. The incredibly adaptive shaver head, enhanced with individually floating foils and trimmer on a pivoting head, can shave hair as close as 0.05mm with fewer strokes. The electric razor’s five shaving modes let you select the best speed for different facial zones, thereby enabling a close shave like never before. The incredible adaptability of the shaver head of this electric razor for men can help you rid facial hair from even the most problematic contours. The shaver’s trimmer and the individually floating foils are all mounted on a pivoting head that is enhanced with MicroMotion and MacroMotion. The shaver head barbers hair as close as 0.05mm, for the utmost precision. The electric razor’s five shaving modes let you adjust the speed to suit different areas on the face. The Flexible Shaving System of this Braun shaver, which incorporates the individually floating foils and the trimmer, enables a more efficient shave with less irritation. The advanced system makes this Braun electric razor perfect for those with sensitive skin. The 5 Action alcohol based Clean and Charge Station that comes with Braun Series 7 799cc 7 Electric Wet and Dry Foil Shaver charges this device, and hygienically cleans, dries, and lubricates its shaver head with the mere touch of a button. The alcohol cleaning fluid of the system eliminates 99.999 percent of germs, making this device extremely hygienic for use.